Burnout is a constant threat for physicians. 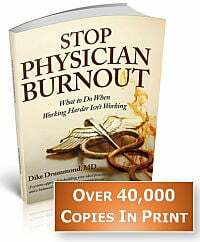 Research consistently shows an average of 1 in 3 doctors suffering from symptomatic burnout on any given office day. In my work with over stressed and burned out doctors, I have found that most of us work way to hard being the Superhero to our staff, patients and families — and don’t have any fun at all. It doesn’t have to be that way. Research shows you can lower your stress (and prevent burnout) with simple steps you can begin taking today. You can even make these activities into stress relieving games. And these are closely tied to one another. If you know reaching a certain goal gives you a reward, you will push yourself to get there and do your own version of a “touchdown dance” when you win. To prevent burnout, nothing works until you actually do it. Playing a game can make the difference between taking action to prevent burnout – and even enjoying it – and simply slogging through your day. - fun things you don’t give yourself very often. The more the better. Ideally not all of them are food! Got your list? Keep this list handy. 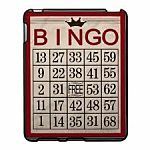 Add to it whenever you think of another prize you would like to win. Now let’s look at 3 research proven ways to lower your stress levels and prevent burnout. 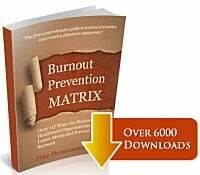 For each one, let me give you a single action you can take tomorrow to lower your burnout risk. Then let me show you how to turn it into a stress relieving game. Remember the last time you saw a professional window washer? A single stroke of their squeegee wipes the window completely clean. You can do the same thing with your breathing — wipe yourself clean of stress and worry in a single breath. This allows you to be completely present with your patients and staff at work. It also helps you leave work behind and be completely present with your family at the end of the day. Tomorrow at work take this squeegee breath each time you touch a doorknob to go into the room with a patient. Touching the doorknob “triggers” your squeegee breath and clears you for the office visit ahead. See what difference you notice in the quality of your day. Keep track of how many times you take a squeegee breath in your day – you can simply put tick marks on a little piece of paper. 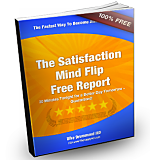 - Give yourself one of the rewards on your list if your number is three or more. - Keep track of your personal best – the most times you practice the squeegee breath in a day – and give yourself an additional reward each time you hit a new personal best. Notice that any day where your number is three or more and a personal best is a double reward day. Take two prizes from your list and feel free to do your touchdown dance as well. What is one relationship that is in need of your attention lately … someone you would like to connect with and it feels like it has been too long? It might be your mom or dad, spouse or significant other, one of your children, a friend. Grab your calendar – right now. Connect with them and schedule a “date” for sometime in the next two weeks. Minimum of 15 minutes – on the phone or in person. Then show up and see how it feels. If it felt really good … make sure you schedule your next date with this person before this date is done. Bring your calendar to the date and ask them to bring theirs. Put your next date on each of your calendars so you have “one in the hopper”. Look for double reward dates – you showed up and remembered to book your next date before this one was done. Pick two rewards from your list and really enjoy them. What is one thing you love about what you do? Think back over the last month or so … what is one interaction you remember that made you smile and reconnected you with what you love about your career again? This is most powerful when you take a moment to write this remembered experience down. Set an intention to experience this again in the day ahead … to seek it out and savor it just once today. Say it out loud, “Today I am going to look for a way to experience (___fill in this black with the thing you love)”. Hold this intention during your day and see how it feels. Good luck on your “treasure hunt”! Double rewards for months when you find treasure twice or more and hit a new personal best. Don’t forget your touchdown dance! Play these games with your staff - in an environment of sharing personal success rather than a competition. You can use these stress relieving games to prevent burnout in your entire office staff. You can prevent burnout immediately with these simple steps. Each one is research proven to work when you actually do them. Playing a stress relieving game dramatically increases the odds you will be successful. Are you ready to prevent burnout and get started? Please pick just one of these stress relieving games now and get going. Don’t forget that touchdown dance.